Not many athletes from Palestine manage to find lucrative careers out of sport. It is a sad reality borne out of numerous factors. There is one, however, who has been making waves, taking names, and carrying the Palestinian colors to new heights. He is Ramallah native Sani Sakakini. Currently playing for the Jiangsu Tongxi Monkey Kings in the Chinese Basketball Association (CBA), the 2.04m Sakakini is averaging 24.9 points, 14.1 rebounds, 2.4 assists, and 2.1 steals per game while shooting 48.3 percent from the field. Not surprisingly, those numbers have made him one of the best players in the league this 2015-2016 season. It's an unbelievable story, Sakakini's journey to this point. He hails from a country that has made headlines more for political reasons than sports achievements. It is a place where serviceable sports facilities and top-level training personnel are sparse. Many promising athletes who have come before him have made the understandable choice to accept citizenship elsewhere. This was the conventional door to better opportunities for Palestinian athletes who had world class talent. Sakakini, however, has opened a new door and blazed a new trail for his countrymen. Instead of gaining citizenship in one of Palestine's neighboring states, he has chosen to not only retain his being Palestinian, but to also resurrect the national basketball program. To this end, he has spearheaded the enlistment of other highly-skilled players of Palestinian descent. Among the most notable ones are Jamal Abu-Shamala, Ahmed Haroon, and Imad Qahwash - all of whom played with Sakakini on the 2015 Palestinian national team that turned more than a few heads in the 2015 West Asian Basketball Association (WABA) tournament and in the 2015 FIBA Asia Championship in Changsha-Hunan. Palestine was not expected to make a lot of waves this year, but they did the exact opposite. They started by besting Syria (79-73) and Iraq (70-62) in the WABA qualifying tournament to advance to the 2015 FIBA Asia joust for the first time in history. Once in Changsha-Hunan, Sakakini led his squad's biggest victory yet, upsetting title contender Philippines on the very first day of competitions, 75-73. It was a stirring and memorable result for coach Jerry Steele’s wards, and it would be a portent of things to come as the Palestinians continued to compete at a very high level. They defied expectations and swept their preliminary group to move on to the second round, where they very nearly advanced to the Quarter-Finals. When the dust settled, Palestine finished a respectable 10th out of sixteen teams - an admirable feat considering it was their maiden effort. As of now, the country’s men's team is rated 75th in the world - the first time they have been able to break into the actual rankings. At the forefront of everything, of course, has been Sakakini, who is the undeniable heart and soul of the team. Whether it is in the CBA or for his country's team, Sakakini clearly plays for a higher purpose. He has publicly expressed several times that his desire to succeed goes beyond having a fruitful professional career. He is playing to rebuild his country's team and to inspire Palestinian players to be resilient in following their dreams. Perhaps, if these dreams are to be fulfilled, a spark will be lit and even bigger and better changes may happen back home. His rise to the top can only be described as self-made. Without ready access to top tier coaching, training, and competition back in Palestine, Sakakini has had to be a journeyman of sorts. At just 27 years of age, he has found himself playing in three foreign professional leagues: the Jordan Premier League, the CBA, and the Lebanese Basketball League. This has helped him become the dominant and productive player he is today, and, more importantly, everything he has learned from these experiences he has brought back home to help raise the level of play in Palestine. 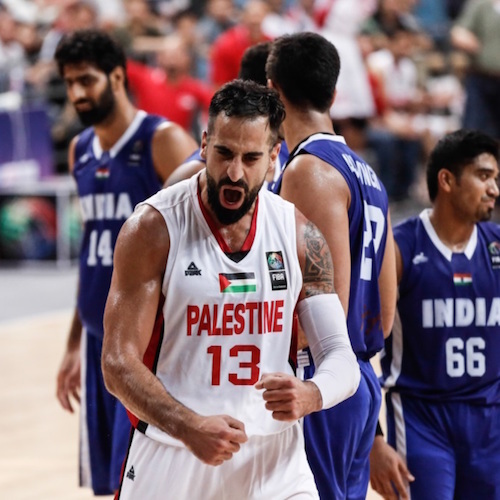 Because of Sakakini's unprecedented and inspiring story, Palestine has finally been seen as a rising force to be reckoned with in Asian basketball. For sure, he will continue to compete at a star level in the CBA and anywhere else he goes. He carries with him the hopes and dreams of his country, and the ripples of his successes will be felt all the way home.